Show the love of God by feeding the birds or other creatures that live in your community. Jesus restores Peter to relationship and leadership by asking Peter three times if he loves him. Peter says yes and Jesus instructs him to feed his sheep- to shepherd God’s people as Jesus had. Jesus then tells Peter that following him and serving him will take him places he does not want to go or expect to go. Finally, Jesus tells Peter to mind his own calling and not to worry or compare his calling to the calling of others. The last two chapters of John illustrate the grace-filled journey of every Christ-follower. Risen Christ, we bless your coming and welcome you again. Thank you for forgiving us and restoring us when we sin and stray. Keep our steps strong and sure on the journey with you. Empower us to welcome and serve and share with everyone we meet, as you have done for us. May the victory and grace of your Kingdom spread and grow, now and forever. Amen. Say a special prayer for all who are suffering, especially the fishermen, as a result of the gulf oil spill, the earthquake in Haiti, and the earthquakes/typhoons in Japan. Was Peter in the upper room when Jesus appeared to the disciples Easter evening, or had Peter separated himself from the group, ashamed he had denied Jesus three times? Whatever the case, Peter goes back to what he knows, fishing. Jesus seeks him out as he did when he first called Peter from the nets years before. Peter’s eyes are opened at the miraculous catch of fish and his restoration begins. Like Peter, I am reminded of my calling from Jesus to be a fisher of men and women. I am also reminded of the great diversity and beauty of those who will be God’s people. So many and yet the net of God’s grace and church will not break. 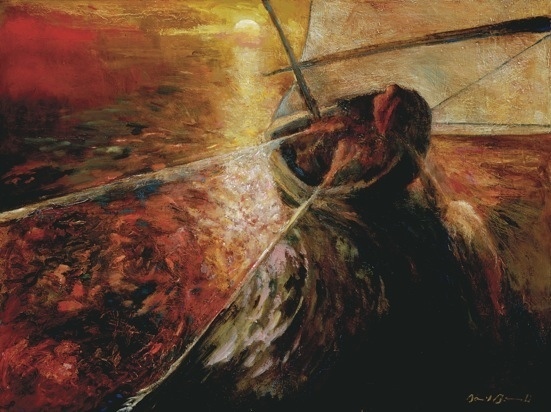 This poem was inspired by Matthew 13:47-50, John 21:1-14, John 12:31-32, Psalms 40:1-3, and the painting Cast Your Net Again by Daniel Bonnell. It was originally written as the sermon for a World Communion Sunday Worship Service. It could be voiced with one or two speakers. Children, you have no fish, have you? It is the Lord! It is Jesus! “Now follow me,” says Jesus. Important book for reminding clergy and laity of the true mission of the church. When you clear away the clutter and concentrate on making disciples through worship, small groups, and service, the church becomes healthy and fruitful. Solid research, solid principles (not programs) presented in an approachable and enjoyable way. If you aren’t into the science behind the statistics, its easy to skip those sections. The simple revolution is here. From the iPod design to Google’s uncluttered homepage, simple ideas are changing the world. Multi-awarded #1 national bestseller Simple Church guides Christians back to the simple gospel-sharing methods of Jesus. No bells or whistles required. Based on case studies of 400 American churches, Thom Rainer and Eric Geiger prove the disciple-making process is often too complex. Simple churches thrive by taking four ideas to heart: Clarity. Movement. Alignment. Focus. Simple Church examines each idea, clearly showing why it is time to simplify. Wonderful, thin volume you will reference over and over again. Martin’s thoughts on the worldly understanding of success, productivity and control are especially helpful for recovering workaholics. This book is best enjoyed in small, reflective bites. Eighty-one reflections that offer refreshment to pastors. Scores of pastors from numerous denominations have found these reflections a pungent reminder of who they are as ministers of Christ. Use a nail or pencil to pierce a piece of fruit or meat. Reflect on the wounds of Christ and our need to believe without seeing. On Easter Sunday, Jesus makes three post resurrection appearances- first to Mary Magdalene in the garden, then to two disciples on the Road to Emmaus (Luke 24), and finally to a group of disciples hiding from the Jewish leaders. In this third appearance, Jesus twice bids those gathered peace and then breathes on them so they will receive the Holy Spirit. Jesus fulfills his promises to rise from the dead and to send the Holy Spirit. Eight days later Jesus appears to them again when Thomas is present so he too may see and believe. Jesus knows what we need and provides it: God’s peace, presence and power through the indwelling of the Holy Spirit. With these gifts we are commissioned and empowered to join Christ in saving the world. In the grief and shame of confronting our sin, we get the wind knocked out of us. In God’s forgiveness our old spirit of fear and anxiety is blown away. Our old, tangled lives are wiped out and we begin fresh. God breathes a new peace into us, the peace of knowing we are loved and forgiven and free, the blessing of being deeply at peace with ourselves and God and the world. God creates us anew, with a new spirit. what more could you give me than yourself? is raise my sails to catch the full wind. One day when our daughters were very little, I took them to the church playground at Epworth UMC in Durham, NC. It was a beautiful, bright blue day under the pine trees, full of play and little girl giggles. It was exactly what I needed. I was beyond tired and stressed from trying to handle seminary classes, children, husband and some semblance of personal hygiene. As I stood there a breeze brushed my face. It was as if Jesus was breathing on me: strengthening me, telling me everything was going to be alright, and confirming my calling. REFRAIN: Great Holy Spirit. Sweet Mystery. whispers a message of love, peace, and grace. Forge our devotion purer than gold. Lisa is especially interested in collaborating with someone to set this text to original music. Click here, for Steve Garnaas-Holmes meaningful prayer on Thomas’ encounter with the Risen Christ entitled A Prayer to St. Thomas. Also consider his post entitled, Thomas’ Prayer. Click here for a powerful reflection on the Holy Spirit as wind and breath of life by Steve Garnaas-Holmes entitled Conspiracy. Click here for reflections and prayers on the wounds of Christ. When Jesus rose the grave clothes were left behind. Reflect on Jesus’ bodily resurrection as you fold some clothes, a tissue, or a piece of cloth. Hell took a body, and face to face met God! It took earth, and encountered Heaven! It took what it saw, but crumbled before what it had not seen! Christ is risen, and not one dead remains in the tombs! For Christ being raised from the dead, has become the first-fruits of them that slept. To Him be glory and dominion through all the ages of ages! In John’s version of the Easter story, Mary Magdalene makes her way to the tomb to find it open and Jesus’ body missing. She runs to tell the disciples. Peter and another disciple run to the tomb to investigate and then leave for home. Mary stays and encounters two angels and then Jesus himself. She runs back to tell the disciples what has happened. Jesus is risen from the dead! The authenticity and transparency of Mary’s emotional journey that first Easter captures my heart. Mary makes her way to the tomb… sobbing, solitary, silent. She is struck by a sudden rush of surprise and horror as she finds the tomb open and Jesus’ body missing. She races back to the disciples- her broken heart crushed yet pounding in her chest. Three of them race back to the tomb to find the grave clothes scattered on the cold, stone slab. The men investigate then leave and she is alone again. Her head swimming and her stomach nauseous, “Where have they taken him?” She imagines all the ways they might be further desecrating Jesus’ body. She looks inside again hoping to wake from this nightmare. Her eyes, now swollen from dust and salty tears are now almost blinded by the brightness of the angels’ appearance. They try to speak to her but she turns away only to encounter someone else. Overcome by anguish, she begs him hysterically for the location of Jesus’ body. Then, through the terror and the pain, she hears her name… Mary. In that exquisite moment, all is instant peace. Her eyes open to behold her beloved Savior. She reaches for him as she collapses to the soft, dark earth. He gives her a message, the most beautiful and hopeful message every given. She rises and runs again to the other disciples, this time alive with joy. Break through the tombs we make for ourselves. Break through the rocks others would bury us beneath. We trust you to raise us up with you. and to make us alive with your joy. Amen. Station XIV Jesus is Laid in the Tomb by Gwyneth Leech. Commissioned by Saint Paul's Episcopal Church in Norwalk, Connecticut. Spend some time smelling the different spices in your kitchen. As you smell them, reflect on Jesus’ burial. The bodies need to come down from the crosses due to the Sabbath. The soldiers break the leg bones of the two thieves so they will die quickly. Jesus is dead already, but they thrust a spear in his side to make sure. 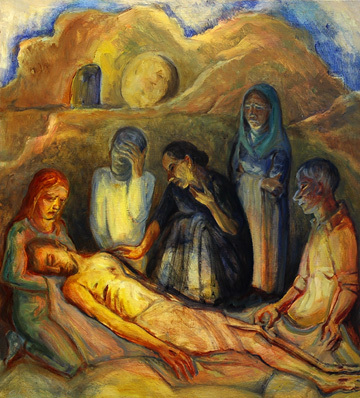 Joseph of Arimathea and Nicodemus bury Jesus in a tomb that had never been used before. We see Jesus who was made a little lower than the angels, now crowned with glory and honor because he suffered death, so that by the grace of God he might taste death for everyone. I am held. I need to be held. I will be held. Who holds me? Death or Christ? What does death taste like?